Photo Above: From left to right: Patrice Bourdelais, Director, Institute for Human and Social Sciences, National Centre for Scientific Research; Ségolène Neuville, Secretary of State responsible for the disabled and efforts to combat social exclusion; Thierry Mandon, Secretary of State responsible for higher education and research; Claire Hédon, President of ATD Fourth World France; Yves Winkin, representing the deputy head of the National Conservatory of Arts and Business. 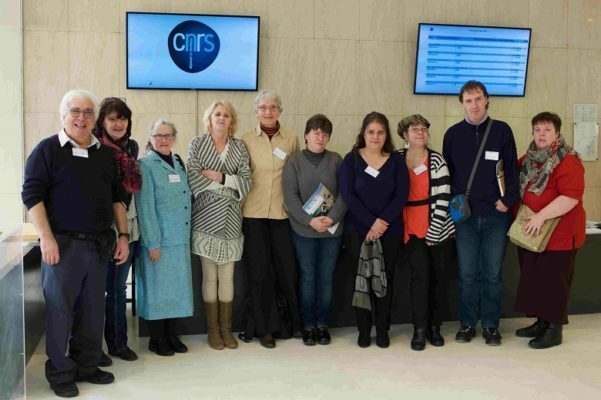 Last March, the NCSR (National Centre for Scientific Research) hosted a colloquium in Paris entitled, “Building Understanding Together”. Organised by NCAB (National Conservatory of Arts and Business) and ATD Fourth World, the event recognized a process called “merging knowledge” which is now an accepted research method in several professional fields including health, education, and social work. 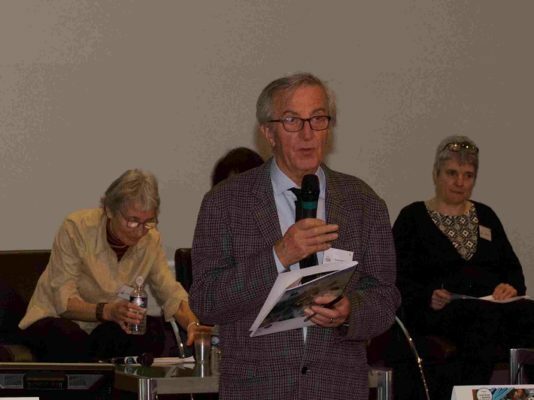 Claude Ferrand, a member of the ATD Volunteer Corps and colloquium coordinator, explained that “Merging knowledge” is a facilitation technique for participatory research. It involves bringing together, on equal footing, perspectives from three groups: researchers, people who have experienced poverty, and professionals such as teachers or social workers. “Living in poverty does not mean that one is lacking in intelligence”, explained Jean-Marie Lefevre in his 1999 presentation of a book on “The Merging of Knowledge”. “It is essential to insist on this point quite firmly. Too often, we try to alleviate poverty by putting in place measures that have not been thought through with people who suffer from it. (…) And yet, if people really listen to us in the effective manner that the Fourth World University program provides, this sort of ‘merging of knowledge’ is possible”. The method seeks to create conditions in which it is possible for people who have a life marked with violence and poverty to express themselves. This requires working in a group setting with supportive facilitators who help manage the dialogue with other researchers. In this way, it is possible to build a shared understanding and to collect information, from all perspectives, that can be communicated easily to other people. Today, other institutions are duplicating this “merging knowledge” approach. The French Economic, Social and Environmental Council (ESEC), for example, has asked to consult with people in situations of poverty in developing several of its position statements. Other research programs, including some in Quebec, have used the “merging knowledge” process in recent years. In a crowded meeting room, researchers, social intervention professionals, and ATD Fourth World members who have experienced poverty discussed how to make this sort of cross-cutting research successful. In particular, the group addressed the “merging knowledge” research effort on new measures of poverty, currently being conducted at an international level by ATD Fourth World and Oxford University. In a Q & A session, a member of the audience asked if “we could do science and hope to have a transformative effect”. “The two are complementary”, assured Nonna Mayer, Director of Research at NCSR. “Today marks a new stage in this work”, concluded Claire Hédon. “It is time that people who have experienced poverty and social exclusion have the opportunity to share freely their questions and their view of the world. It is important that they are allowed to question accepted knowledge, to forge new ways of seeing the world and doing things. The research community can make a significant contribution to this effort. ATD Fourth World Colloquium Participants, from left to right: Marc Couillard, Doris Mary, Lucienne Soulier, Raymonde Languet, Françoise Ferrand, Jacqueline Steg, Maria Théron, Marie-Ange Billerot, Christian Barot, Patricia Chvedco. Missing from the photo are Roland Hairion, Marianne de Laat, and Hervé Lefeuvre.